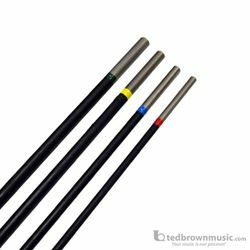 These contemporary style beaters feature a stainless steel tubular beater face isolated from a core shaft using a special rubber compound. Each beater features a comfortable black latex handle (identical in diameter and coupled to the beater face). Due to the increase weight of the beater face, these beaters produce a great array of spectral overtones from triangles.